One idea at the core of nineteenth century painting is known as the Theory of Sacrifices. A poetic quality, it was believed, comes from the sacrifice of needless detail. 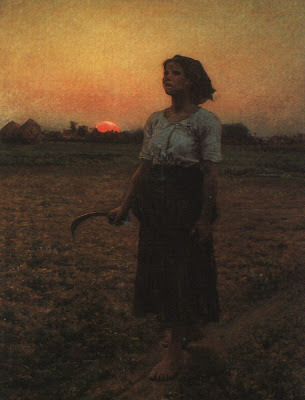 Image: "Song of the Lark" by Jules Breton. James, once again a timely post for which I am grateful. I'm finishing a magazine cover today, a portrait of someone in their office. I love detail, so there's always the temptation to add just a few more "identifying items" to this piece; objects that reinforce the identity of the person portrayed. A few such items do real work. Beyond that...it's good to be reminded that "reinforcement" can ultimately undermine the primary image. I wonder if that's why when I do a drawing in five minutes vs five hours, the five minute one looks stronger. Thanks for the post. I'm going to pay attention to that when I'm working on something. What strikes me is that the prose was so dense, totally the opposite of what he was saying. I've been thinking recently how the sacrifice of detail applies to comics and "sequential art." 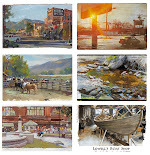 A lot of background detail is great for establishing the character of a setting, but after a few evocative panels, many cartoonists see fit to reduce the background detail and focus on the action and the characters - that is until another setting is established, when they crank up the detail again. I think this approach works well, not least of all because it mirrors the way we perceive our actual surroundings: after surveying the features of a room (or whatever), we tune it out and focus on what's going on in that room. All of this, however, is in the aid of clarity, not for the purpose of striving for some "poetic quality." Try doing the squint test on that painting. It's seriously only two colors! - or, to put it another way, if a picture isn't any good stated simply, it won't be improved by adding more stuff. These are all great comments. Everett, what you say is so true. When you add the element of time in comics or movies, we really do love detail to establish a setting. Someone like Carl Barks then knew how to really strip it the storytelling down to the essentials. It really does correspond to the way we "read" a room when we first enter and then tune out all the extraneous stuff when we get into a conversation. Could this be paraphrased as the old "Less is more", or expressed as one command - "Simplify!" ? When I did comics I was always fighting the detail issue; when to scumble in a background, when to draw it out in detail, and when to just leave it out entirely... Trying to tell a story with the absolute minimum ink really puts your decision making to the test. 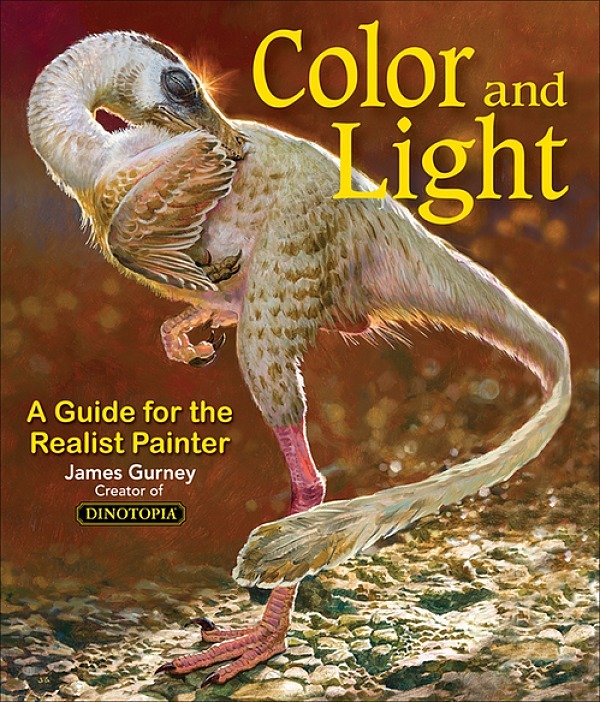 I was chatting about this with my roommate the other day after running up against some value vs. hue issues with the flower I was painting, and I remember telling her that the best way to avoid difficulty was to not paint difficult, noodly things in the first place. :) Kinda like Mr. Miyagi's "First Rule of Self-Defense: No Be There!" First Rule of Simple Painting - Don't Paint Hard Stuff! First time i have visted your blog your topic is awasome,In my point of view Anything consecrated and offered to God, or to a divinity; an immolated victim, or an offering of any kind, laid upon an altar. "The Song of the Lark", I first saw this painting almost forty years ago at the Chicago Institute of Art. It is an impression never to be forgotten.